Each year, AUSS members attending the organization’s annual conference take an excursion to a local area of interest. This year, the group visited Beak & Skiff Apple Orchards in Lafayette, New York. University College hosted the national Association of University Summer Sessions (AUSS) annual conference Oct. 14-16 at the Marriott Syracuse Downtown. Since its formation in 1917 (Syracuse University is a founding member), the AUSS has served as a forum for discussing the theoretical and practical issues of summer sessions. 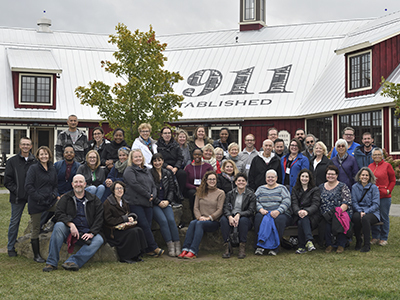 Administrators from 40 colleges and universities across the country, and as far away as Alaska and Hawaii, attended the conference to discuss best practices and challenges, as well as brainstorm on how to manage and execute trends in summer sessions. The round-table format allowed for informal but in-depth discussion on topics of interest and provided for professional development and growth. Topics included programming, finances and revenue sharing, online and hybrid course offerings, obstacles presented when recruiting international students and winter sessions. AUSS members reported the continuing trend of flat or declining on-campus undergraduate summer session enrollments, while both online and pre-college enrollments continue to rise. SU’s Summer College Program saw an increase of 41.5 percent this year: from 429 students in 2017 to 607 in 2018. Of those 2018 students, 530 hailed from 33 U.S. states, Puerto Rico and the U.S. Virgin Islands, while the other 77 came from 23 other countries.